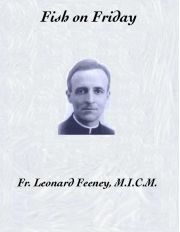 By Father Leonard Feeney, M.I.C.M. The words, spoken or written, of a soul that genuinely loves God have a tone to them which always rings true. Couple this truth with literary genius, deep spiritual discernment and childlike simplicity and you are close to describing Father Leonard Feeney, the author of Fish on Friday. These fourteen Catholic essays, Father Feeney's youthful best, mirror a heart that is as light and humorous as it is religiously profound. 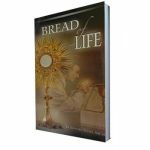 Loreto Publications is delighted and proud to put this American Catholic classic back in print. Too many generations have been deprived of Father Feeney's winsome literary sagacity when his poems and essays were mysteriously removed from Catholic schools on account of his heroic defense of a defined doctrine of the faith. No one can possibly read "Fish on Friday," The Queen of Hearts," "Charlie Maloney," or any of the other eleven essays in this book without frequent bursts of wholesome laughter and (be forewarned) without a welling of those kind of tears that expand the soul. After reading this book one will clearly see that Our Lord and Our Lady were preparing this priest and theologian all along with superabundant graces to become what he became — one of the greatest apostles of the twentieth century. In the February 17, 1994 issue of "Catholic New York", John Cardinal O' Connor began "An Informal Pastoral on Lent" with this paragraph: "Long before he ran into a bit of trouble, from which it was obvious that he would recover, given his whimsical sense of humor, Fr. Leonard Feeney, S.J., wrote some of the most delightful things ever published in our land. "Fish on Friday" was one of the best. It first appeared 60 years ago, and never a Lent goes by without my renewing my friendship with it....".